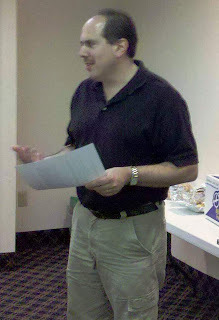 At our April 1st meeting, we were visited by guest speaker Marshall Gisondi. Marshall is a vision‐impaired, professional piano tuner and technician. He was trained at the School of Piano Technology for the Blind, located in Vancouver, Washington. The school has been in place, educating the blind to repair and service pianos, since 1949. He educated us on the proper care and maintenance of pianos. It’s not as easy as it would seem! He explained the steps necessary to conduct a thorough piano tuning, and encouraged piano owners to hire professionals to move pianos, and not do it themselves. Marshall shared with us many anecdotes of his career. He also gave us a list of Do’s and Don’ts for piano care. He told us about the school he attended, and how students are trained by touch and sound, instead of by sight. In some ways, using touch and sound is better than sight when it comes to pianos. The school teaches only vision impaired people, making it one of the few such institutions worldwide.